A topic of discussion for visitors at the Cold War Air Museum has been; "What color is that?" Or; "Why did the Soviets paint their cockpits green?" Model making web sites have frequent questions and discussions about getting the exact color of soviet aircraft cockpits, exactly right. Fortunately, we have the advantage of having the "real thing" with which to compare. We have been told that the color chosen by Soviet designers helps to reduce stress and maintain a pilot's effectiveness on long missions. While the Soviets were not the only country (or manufacturer) to use this color, they have used it for so long and in such great numbers that it has become a trademark of Sov-block aircraft. Because not all aircraft are painted at the same time, or at the same place, there is some inevitable variation in color. Some aircraft have more of a green tone. And, some have more of a blue tone, even when the aircraft come out of the same factory in the same country. In general though, the description "blue-green" seems to fit slightly more of the aircraft we see (especially the newer ones), than the alternate description often given as "light green". These three panels, or sections of panels from different aircraft, show some color variation even though all three came from the same factory. We don't worry too much about making an exact color match to some mythical factory standard, but we do make a color match for individual aircraft when necessary during restoration. Besides, we are mostly guys, and most of us simply made it through kindergarten with the 8-count box of crayolas, not the 64 count box (I don't even know how they come up with the names for so many colors). 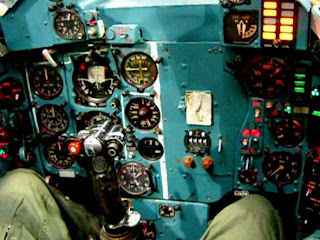 While the paint store most closely matched the blue-green above with a commercial color named "Mermaid Green", it's just not right to say "Our fighter cockpits are decorated in Mermaid Green". So for now, we'll just stick with something that fits within our limited repertoire and continue to refer to all of these colors as simply blue-green, or more simply as just that "Russian Cockpit Color". Among the many projects at the Cold War Air Museum is the restoration of our Mi-2, Bord 212. When completed, we will be applying for airworthiness certificates for both 212 and 213 to join 211 on flying status. As previously reported during the restoration of Bord 211, we have had to deal with some corrosion in these aircraft. For previous details, click on the labels at the botttom of this article to follow the various story threads. After the fuel bladder was removed, cutting the old metal away exposed the fuel compartment. Areas within the compartment were inspected and treated as necessary. The old skin was used as a template for all rivet and access panel hole locations to be traced onto a new piece of aircraft aluminum. Charles then carefully cut and trimmed the new piece for a perfect match. After the external strengthening pieces ("Hats") were riveted in place, the rivet tails on the inside were covered with Polykin tape to protect the fuel bladder. Both the inside and outside were treated and coated before the hats and doublers, seen here in contrasting color, were reattached. We expect the next step, "shooting" (riveting) the skin back on, will take place soon. 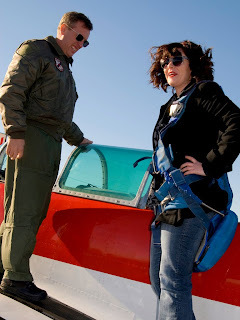 It is fun to be associated with the Cold War Air Museum (although admittedly, some days are more "fun" than others). 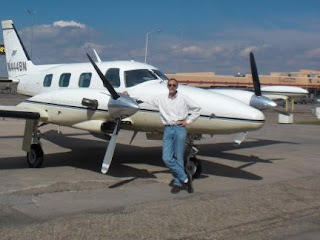 One of the fun aspects is to hear from so many people who have stories to tell, or aircraft to sell. The MD-160, (NATO code named "Duck", Russian "Hen Harrier") is a unique "aircraft". Intended to be the first of a new class of anti-ship weapon platform, only one was completed, serving with Soviet and Russian forces through the 90's. With engines mounted in a canard at the front, six nuclear capable missile tubes above the fuselage and a radar/sensor suite on the tail, the MD-160 was intended to approach its target from below radar coverage at speeds approaching 300 knots. More information about the design and class can be found at these Global Aircraft and Wikipedia links. Recently, we were contacted by Igor, who has produced an active journal with more pictures and information about this aircraft. 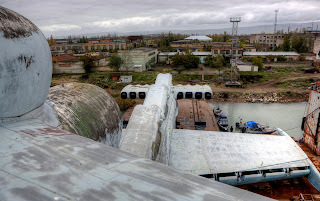 With a 240 foot length, 144 foot wingspan and a maximum takeoff weight of 882,000 pounds, this is a truly massive project in the finest Soviet tradition. For those of us that can't read Russian, Google makes a valiant attempt at rendering a translated version of Igor's journal. A sense of humor is helpful when reading automated translations. In this effort, one of my smiles came from Google's choice description of an engine part as a "marching band". After construction, the craft was launched into the Volga river on 16 July, 1986. Although reported to be capable of limited flight and having the appearance of an airplane, most Western sources show the MD-160 to have been commissioned as a ship in the Soviet Navy. Like sea birds skimming just above the ocean, an ekranoplan uses ground effect to decrease the energy required for flight. 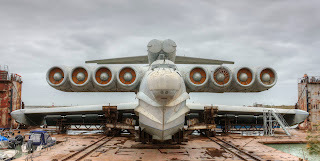 In addition to the MD-160, the Ekranoplan Program developed high speed naval transport designs. 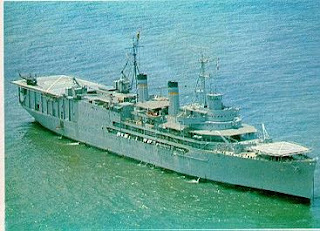 A sister ship, the second in the LUN series, was changed on the drawing boards from an attack craft to a mobile hospital or rescue ship, but it was never completed. Experimental designs using ground effect pre-date WWII and the inherent efficiency of the design continues to see expression in experimental projects such as the Boeing Pelican ULTRA. We enjoyed Igor's journal and hope others will enjoy it as well and by the way, if you are looking for a very large piece of Cold War History, this one might be available. It's too big for us, at least until our next hangar expansion or until we can construct a Texas sized lake or river nearby. Work on the UH-1 being restored at the Cold War Air Museum required removing the transmission and engine so that various components and compartments could be cleaned and checked. Removing the transmission should have been fairly straightforward, disconnect and unbolt everything, then lift it out. Some persuasion was required however, because forty years of sitting in place made it reluctant to move at first. Fortunately, we only had to use "American" persuasion, not "Russian" persuasion. No big hammers were required. After the transmission came out, it was re-mated with the mast assembly. The mast head had been removed for transport. This delivery team at least understood the concept of bridge clearance. Old fluids were drained and inspected, and new fluids were added and circulated. The old sight glasses at first seemed unusable, but after a good cleaning they again deserved their name. Re-mated, the transmission and mast form a sealed system preventing inadvertent contamination. A temporary mount holds the system upright and allows it to be moved around while work proceeds. The engine came out more readily. So far, everything that is supposed to rotate does, but bore scoping and more component inspections are on the schedule. With the engine and transmission out and the compartments clear, teams can tackle each project independently, calling upon each other for further support as necessary. The UH-1, serial number 62-1890, being restored at the Cold War Air Museum is the subject of ongoing historical research. We know from military records that she was deployed to Vietnam with the 56th Transportation company in 1966. 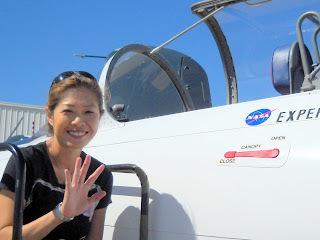 Military and FAA records further reflect that the aircraft was returned to the U.S and served with various units before being released to the National Guard and thereafter to the Washington National Forestry Service, where she gained her "N" number, 333WN. We are appreciative of the various web sites and veterans groups who have attempted to preserve their unit and aircraft histories. It may be possible that the picture below is of our ship, or one like ours, "in country". We are hoping to hear from everyone who has a story or pictures to share from 62-1890's past. 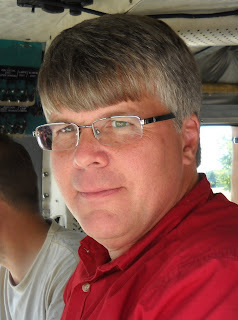 Pete, one of our associates, contacted Major Gerald Royals (Ret. ), a former commander of the 56th, who shared some recollections of 62-1890. 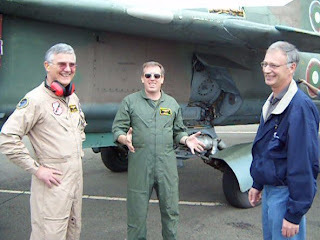 A picture of Maj. Royal "in his younger days" and several photos from unit operations are on the 56th's page at the Fly-Army-Air website. Our thanks to Major Royal for his information and the picture and information found on his web page. 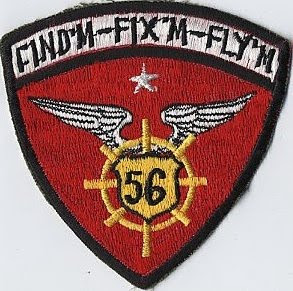 The 56th was a helicopter recovery company, call sign "Good Nature". Recovering damaged helicopters from the field and repairing them accounted for keeping more than 10% of the airborne unit's flying. An early motto used by the unit was "You Crash and Call - We Dash and Haul". Inspection of the pictures on the website shows three generations of nose art. The final insignia adopted by the unit, is seen on the nose of the UH shown beside the Major and matches the unit patch shown below. 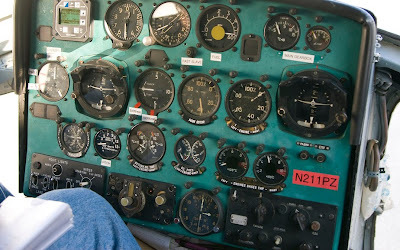 "Find'm, Fix'M, Fly'M" certainly fits the history of the Cold War Air Museum as well. 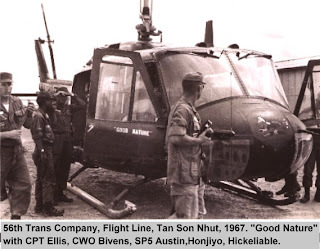 Antihelicopter mines saw their first use during the Vietnam war. Improvised explosive devices were placed in likely landing areas with the intention of destroying arriving aircraft. From what we have learned to date, one such device went off underneath 62-1890 while she was attempting to recover another helicopter downed in a previous landing. Although the belly of the ship was heavily damaged, she was flown back to base where further inspection scheduled her for extensive repair. Flown to the USNS Corpus Christi Bay, a floating repair depot, she was eventually returned to the U.S. for overhaul. We hope to hear more about this worthy aircraft and her extensive history. Please contact us with updates that we can share as her restoration continues.